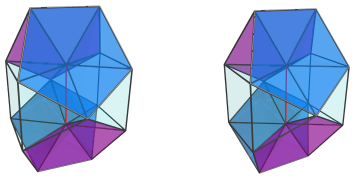 The bilunabirotunda pseudopyramid, or J91 pseudopyramid for short, is a CRF polychoron belonging to the family of pseudopyramids, polytopes that are derived from true pyramids by a modified form of Stott expansion, consisting of a base facet and lateral facets that taper to a subdimensional apex that is not necessarily a point. It consists of a bilunabirotunda (J91) base, and 4 tetrahedra, 4 square pyramids, 4 pentagonal pyramids, and 2 triangular prisms that taper to a single edge above the J91. It was discovered on 23 Feb 2014 by W. Gevaert of Netherlands (aka student91). 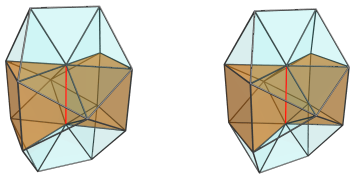 The icosahedron is faceted according to one of its subsymmetries, yielding a non-convex polyhedron, and then Stott expansion is applied to make it convex again. 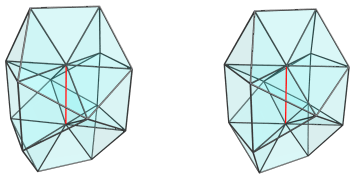 Applied to the icosahedral pyramid, this process turns the icosahedral base into a bilunabirotunda, while the apex of the pyramid is lengthened from a point to a unit edge. 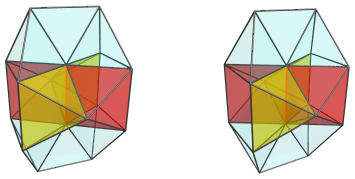 Four of the 20 tetrahedra are preserved, while the rest are deformed into or replaced with the other cells found in the J91 pseudopyramid. 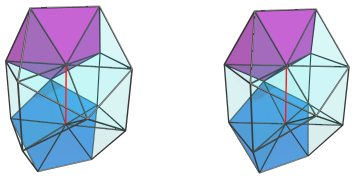 We shall explore the structure of the J91 pseudopyramid via its parallel projections into 3D. The red vertical edge in the above image is the apex of the pseudopyramid, and is the part closest to the 4D viewpoint. 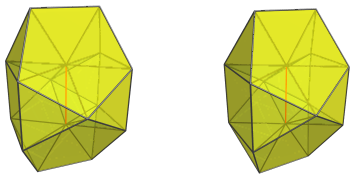 Like the icosahedral pyramid from which it derives, the J91 pseudopyramid is quite shallow, having a height of only 1/φ (approx. 0.61803) for an edge length of 2. Last updated 14 Nov 2018.